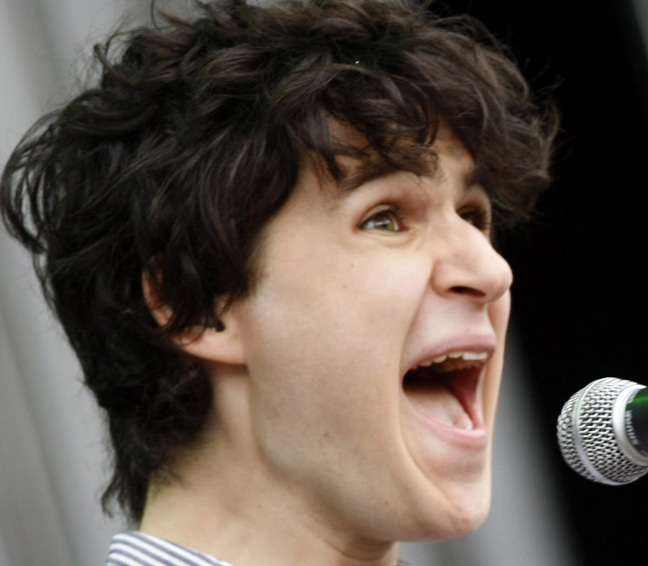 Ezra Koenig of Vampire Weekend – the band apparently the Press love to hate. Back to current musical events this week. Tonight it’s a concert from the 2013 Dcode Festival in Madrid, recorded yesterday (September 16) by the venerable and excellent RNE Radio 3. Word about the broadcast – the announcers get a little chatty and sometimes they spill over to the first bar or two of a song. The assumption is there is a method to the madness. Namely, they don’t want you running around selling this broadcast on some street corner or swap meet. I respect that. Frankly, if getting a concert broadcast live from the stage means having a few excited words spill over into bodies of songs in order to prevent bootlegging – have at it. Only together a reasonably short period of time, Vampire Weekend have achieved a pretty strong following, as well as a pretty healthy disdain from the Press. They’ve been chastised as derivative, pretentious, disingenuous, Ivy-League musical shoplifters and musically inauthentic – and those are the reasonably sanitized comments bandied about in print. Needless to say, they are either doing something right or they are having fun rubbing some people the wrong way. In either case, the burden of getting your performance across does come with certain caveats. Namely; you aren’t going to loved by everyone no matter how hard you try. My take on Vampire Weekend is they are a pleasant non-threatening Pop Band that makes no bones about being not-terribly profound. They have fun, the audience has fun and sometimes that’s all it is – in this case, the cigar is just a smoke, and Pop Music is something to have fun with and there is nothing wrong with that, and there never was. The mainstream offers up a lot worse on an almost hourly basis; maladroit attempts at post-pubescent twerking not-withstanding. Compared to them, Vampire Weekend is downright cerebral. All that said, Vampire Weekend are a hugely popular band with a large following and if you aren’t familiar with them, here is a concert they performed just a day ago to give you some idea what the deal is. Whether you like them or you hate them, at least you got to hear them. And as I always say – “ignorance of your culture is considered uncool”. ’nuff said. Hit the Play Button.